On occasion, it may be the case that you dispatch an order to a customer and for one reason or another, this order is returned to yourselves either in part or full. As you can imagine, without the correct functions in place this can throw a number of figures out of sync. The Goods Returned Routine is there to update the system should you have any stock returned to yourselves. This help sheet will run you through how to do a standard return. On the main Goods Return screen, you will see a list of recent open sales orders. Fully completed orders will not be displayed. 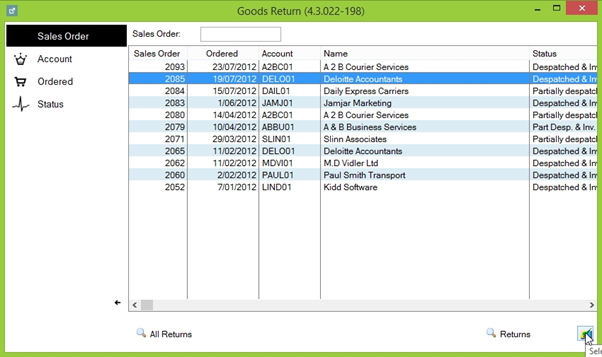 Highlight the order you have returned goods for, then click the green checkmark in the bottom-right of the screen. 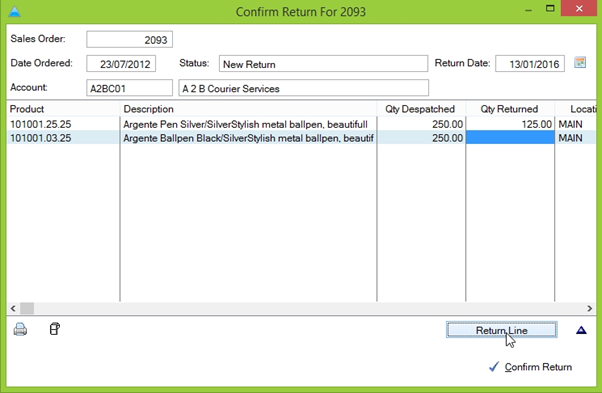 This will bring up the Confirm Return screen, where each line of the related order is displayed. You will note the ‘quantity Returned’ column towards the right-side of the screen. There are a couple of options for how to amend this. If only a portion of an order was returned, you can enter this by highlighted the required line of the order and double clicking the ‘quantity returned’ field, bringing up a cursor so you can enter quantities freely. If the entire quantity was returned, you can enter this slightly quicker by highlighting the desired line and clicking the ‘Return Line’ button below the table. 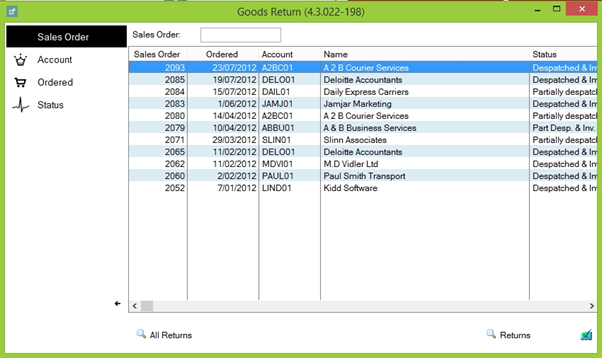 This will automatically enter the total number of goods in the Returned column. If at any point you enter an incorrect figure, you can highlight the line and click the ‘Don’t Return Line’ button, which replaces the ‘return Line’ button once a quantity is entered in ‘Returned’. Once you’re happy with the changes you’ve made, click the ‘Confirm Return’ button in the bottom-right of the screen. 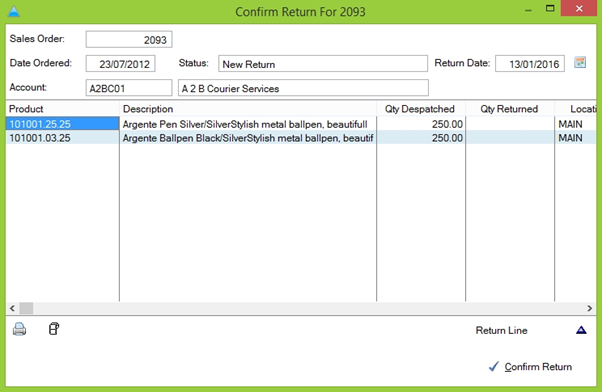 After confirming the return, the ‘Reason for Return’ screen will be displayed. If you have added any standard options into ‘codes & Phrases’ these will be displayed here. 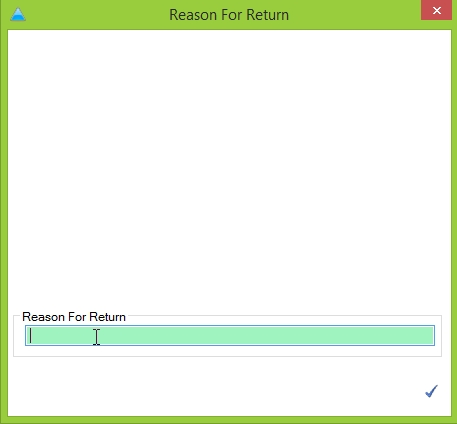 You also have the option of manually entering a reason for the return. 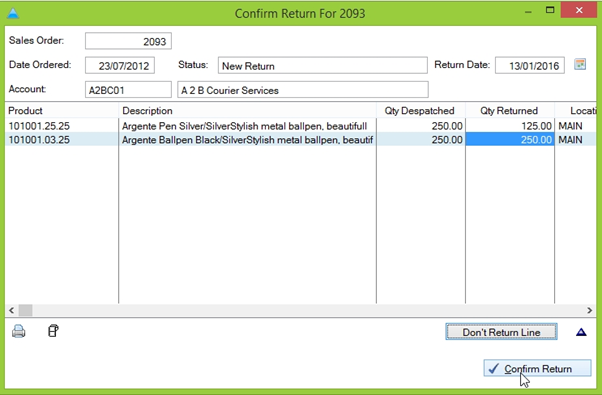 After confirming the reason for return, another screen will be displayed with a couple of checkbox options. Review the options and tick any actions you wish to carry out, then click the blue tick in the bottom right of the window to save your changes. 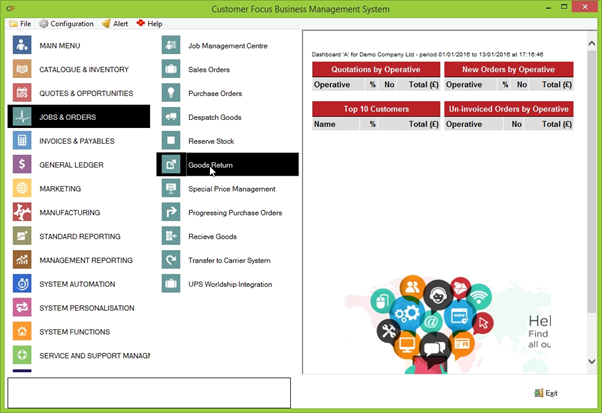 This concludes how to carry out a standard goods return within Enterprise.